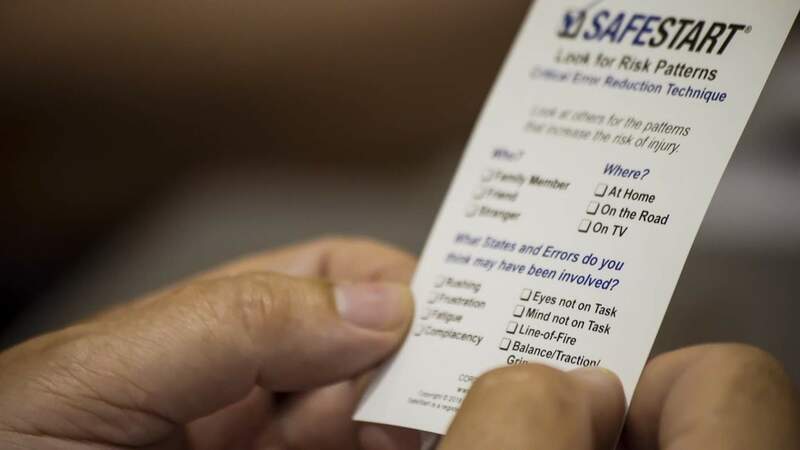 At the heart of SafeStart are Critical Error Reduction Techniques (CERTs): participants learn about these in five Core Training Sessions, each lasting an hour-and-a-half and implemented in a classroom format. Unit 5: Critical Error Reduction Techniques; Taking SafeStart Home. The opening pair of sessions are usually conducted by a SafeStart Trainer. The others can also be delivered by a SafeStart Trainer but can equally be led by your company’s own Certified Trainer, once that person has undertaken a train-the-trainer course and been certified accordingly. During their Train-the-Trainer initiation, in-company trainers go beyond improving individual awareness levels and understanding the patterns that lead to injury to learn optimal usage of the SafeStart method and teaching approach, along with delivering (or co-delivering) a session to the team. Each unit includes video materials, the sharing of stories, a discussion portion and workbook-based exercises. Participants get a SafeStart Binder containing five workbooks, together with a SafeStart Home kit at the end of the course. Further formal elements are deployed within SafeStart for long-term use by companies intent on organisational transformation. Taken as the entire course, deliverables leave trainees fully equipped to maintain safety at work and at home 24/7. Long-term effectiveness pivots on commitment and follow-through on the part of company leadership from the outset. During a half-day Leading SafeStart 24/7 workshop, the extended leadership team will be given tried-and-tested resources enabling a renewed and sustainable safety culture. Delivers techniques and tools that address skills needed for safety communication. Integrating critical SafeStart concepts into the wider culture and operational systems of your organisation to guarantee non-stop improvements to safety management. In a single half-day session, we furnish the Steering Committee with all that they need to completely underpin an effective SafeStart programme. This starts during the roll-out of the core modules and afterwards for long-term success and sustainability. Guidance is given on the integration of SafeStart into the legacy Safety Management System. Keeps the whole organisation on track and in gear for permanent change. Case studies and SafeStart consultant stories to skirt pitfalls. Inspiring examples proven to optimise employee buy-in and continuous self-improvement. The double-sided Rate Your State card makes it really easy to identify critical states and to self-trigger before committing an error. This practical programme applies SafeStart in any organisation, converting SafeStart concepts into fresh habits and skills that sustain the desired safety renewal over the long-term, delivering simple and productive methods that nurture skills-improvement and safety communication. With Rate Your State, supervisors are empowered through a tool that will both engage all concerned (e.g., through a universal and non-judgmental SafeStart lexicon) and develop an understanding of the true level of risk in real time. Rate Your State ranks among the most effective ways to maintain and develop SafeStart safety gains and is shown to be effective in fighting complacency. By leading employees to understand and evaluate their current frame of mind, Rate Your State puts error, safety and risk front and centre, forestalling a reversion to old ways that can undermine safety. Alongside the on-site consulting engagement (four hours of in-class training), Rate Your State is accompanied by one-on-one mentoring for every person signed up for Rate Your State. Furnishes an extensible communication platform that can, if preferred, be integrated into a traditional observation-and-feedback approach such as SafeTrack. Combats inertia while never losing sight of error, safety and risk excellence. Human beings have round-the-clock lives, so any safety philosophy worthy of the name must take a 24/7 approach: the SafeStart Home programme is a critical element for meeting this challenge. When going through the SafeStart programme, each worker is given a Home Kit that can be used to dramatically improve safety in their private lives. The process of passing on this knowledge to their families enables trainees to incorporate their new skills and insight into their daily lives, a dynamic that will then rebound positively back in the workplace. A Certified SafeStart Implementation Specialist will undertake an on-site Implementation Assessment to formally review success metrics, highlight shortcomings and present next steps for safety awareness-raising and monitoring programmes. SafeStart consultants operate using a knowledge base derived from the successful roll-out of the programme in a wide variety of sectors and workplaces. Compelling and digestible ideas that stimulate and encourage commitment, thus renewing worker engagement. Unforeseen benefits: greater productivity and quality gains often come about as SafeStart principles and skills are applied to error-reduction across departments. To learn more, download a free brochure or jump in and get started!